Space Bags can reduce our clutter by up to 75%. 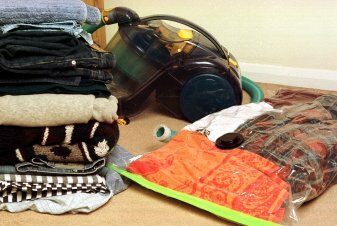 use a conventional vacuum cleaner to remove all the air. Space Bags can be easily stored in cupboards, under the bed or in a drawer. The air tight Space Bags protect items from dust, dirt and damp. What makes space bags special? How much do space bags store? Would you like contacting if or when space-bags becomes available again?"